Australia is a vibrant, multicultural country. We are home to the world’s oldest continuous cultures, as well as Australians who identify with more than 270 ancestries. Since 1945, almost seven million people have migrated to Australia. This rich, cultural diversity is one of our greatest strengths. It is central to our national identity. In 1975, the Racial Discrimination Act came into force, making discrimination in different parts of public life against the law. The Act, which was Australia’s first federal anti-discrimination law, formalised our commitment to the United Nation’s Convention on the Elimination of All Forms of Racial Discrimination. In 1995, the Act was extended to make public acts of racial hatred against the law. Today, the Act continues to send a strong message about our common commitment to racial equality and the importance of a fair go for all. Despite this legal protection, too many people in Australia continue to experience prejudice and unfair treatment because of how they look or where they come from. One in four of Australia’s 22 million people were born overseas; 46 per cent have at least one parent who was born overseas; and nearly 20 per cent of Australians speak a language other than English at home. 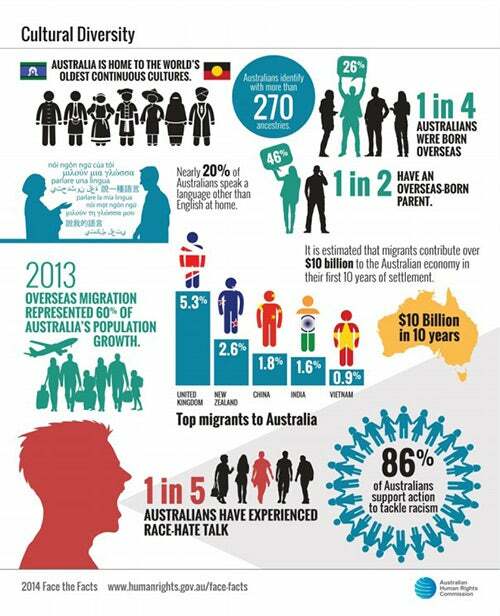 In 2013, overseas migration represented 60 per cent of Australia’s population growth in the year. People born in the United Kingdom continue to be the largest group of overseas-born residents (5.3 per cent), followed by New Zealand (2.6 per cent), China (1.8 per cent), India (1.6 per cent) and Vietnam (0.9 per cent). In 2013-14, 163 017 people from more than 190 countries were approved to become Australian citizens. Migrants make an enormous contribution to Australia’s economy and provide an estimated fiscal benefit of over 10 billion dollars in their first ten years of settlement. In 2010-11, international education activity contributed $16.3 billion to the Australian economy. One in ten Australians (1.5 million of the nation’s adult population) believe that some races are inferior or superior to others. 18 per cent of Australians surveyed said they had experienced discrimination because of skin colour, ethnic origin or religion. The most often reported location of discrimination was the neighbourhood (58 per cent), followed by shopping centres (42.8 per cent) and at work (39 per cent). Of the 500 complaints lodged under the Racial Discrimination Act in 2012-2013, 192 related to incidents of racial hatred. This was a 59 per cent increase over the previous year, with a large proportion of the complaints (41 per cent) involving material on the Internet. 15 per cent had difficulties having their skills or qualifications recognised. Most new migrants say they feel a strong sense of belonging to Australia and that this feeling deepens over time. Most Australians (86 per cent) support action to tackle racism in Australia. Since being launched in 2012, over 200 organisations – from the business, sports, education, local government and community sectors – have signed on as supporters of the national anti-racism campaign, Racism. It Stops with Me. The vast majority of Australians (84 per cent) believe that multiculturalism has been good for Australia. The Commission helps people resolve complaints of discrimination under the Racial Discrimination Act. The Act protects people across Australia from unfair treatment on the basis of their race, colour, descent, or national or ethnic origin. It also makes racial vilification against the law. The Race Discrimination Commissioner undertakes a wide range of activities to address racism and racial discrimination, which includes implementing the National Anti-Racism Strategy and coordinating the national anti-racism campaign, Racism. It Stops with Me. The Commissioner also undertakes research projects and provides policy advice on issues affecting different groups in the community. Australian Bureau of Statistics, 4102.0-Australian Social Trends (April 2013). Australian Bureau of Statistics,3101.0-Australian Demographic Statistics, September 2013 (March 2014). 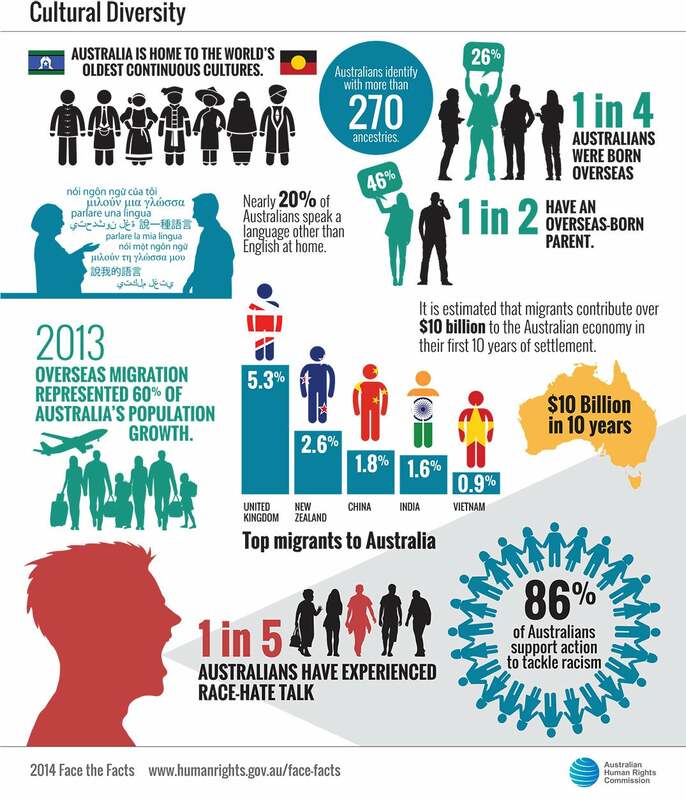 Australian Bureau of Statistics, 3412.0-Migration, Australia, 2011-12 and 2012-13 (December 2013). Department of Immigration and Border Protection: Facts and Statistics - Australian citizenship statistics (2014). Department of Immigration and Citizenship, Trends in Migration: Australia 2010–11 (2012), p 109. Australian Education International, Export Income to Australia from Education Services in 2010–11 (November 2011). University of Western Sydney, Challenging Racism Project: National level findings (2008), p 2. Scanlon Foundation, Mapping Social Cohesion 2014: National report (2014), p 23. Scanlon Foundation, above, p 24. Australian Human Rights Commission, Annual Report 2012-2013 (2013), pp 132-133. Australian Bureau of Statistics, 6250.0-Characteristics of Recent Migrants, Australia, November 2010 (May 2011). Ipsos-Eureka Social Research Institute, The Ipsos McKay Report: SBS Immigration Nation thought leadership research (2011), p 47. University of Western Sydney, note 7, p 3. Scanlon Foundation, note ‎8, p 43.